The Guardian reports that a Polish man has been detained in an immigration removal centre after reporting an alleged crime. The paper says Miroslaw Zieba, 48, and his wife, Mariola, went to police after they say their landlord walked into their flat with two other men and forced them out, threatening them with a kitchen knife and baseball bat. The paper says that when the couple reported the incident to police, they were questioned about their immigration status. Mr Zieba was taken to Colnbrook Immigration Removal Centre where he remains. 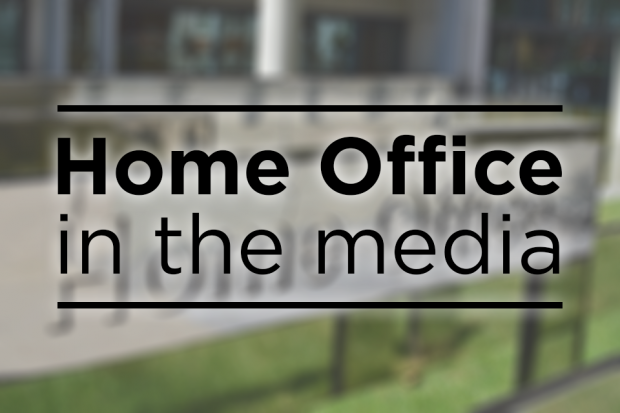 Please find the Home Office statement below. Mr. Zieba came to our attention because of a criminal offence he committed in June 2016 in the UK where he was cautioned by police for being in possession of a blade in a public place. Subsequent checks showed Mr. Zieba had committed a string of serious offences in Poland including burglary, attempted blackmail and threatening to harm a witness or juror, which he served prison sentences for. As a result we began deportation action. We’ll always seek to deport foreign national offenders with a history of serious or persistent convictions overseas. There is print coverage in the Times, Telegraph, Mail, Express, Sun, Mirror, Star and Standard of a terror suspect who allegedly encouraged extremists to attack Prince George. The papers report that Husnain Rashid, 31, allegedly used encrypted messages on the messaging app Telegram to communicate with Daesh supporters and share an image of the four-year–old and the address of his primary school, Westminster Magistrates Court heard yesterday. The papers say Mr Rashid now faces charges of preparing acts of terrorism and assisting others to prepare acts of terrorism. He will appear before the Old Bailey on 20 December 2017.